Irreversible antagonist of nicotinic acethylcholine receptors (nAChRs). 74-aa polypeptide derived from the venom of the banded krait, Bungarus multicinctus. Selective for α7 receptors over α3β4 receptors (IC50 values are 1.6 nM and >3 μM, respectively). Blocks neuromuscular transmission. Inhibits opening of nicotinic receptor-associated ion channels. Soluble in any aqueous buffer. It is recommended that all preparations are centrifuged before use. Functional Studies - alpha-Bungarotoxin, Subtype-selective alpha7 nAChR antagonist (ab120542)Monesson-Olson et al PLoS One. 2014 May 2;9(5):e96641. doi: 10.1371/journal.pone.0096641. eCollection 2014. Fig 4. Escape responses from touch and optical stimulation of wild type and myo6b:ChR2 transgenic larvae. Briefly, larvae were anesthetized, mounted, and microinjected in the heart with 125 µM α-bungarotoxin to block muscle activity. (A) Diagram depicting the Mauthner cells (M), a pair of neurons in the hindbrain of teleost fish. The axons of the M-cells project into the spinal cord where they synapse on primary motor neurons and elements of the central pattern generator responsible for left-right tail motions. 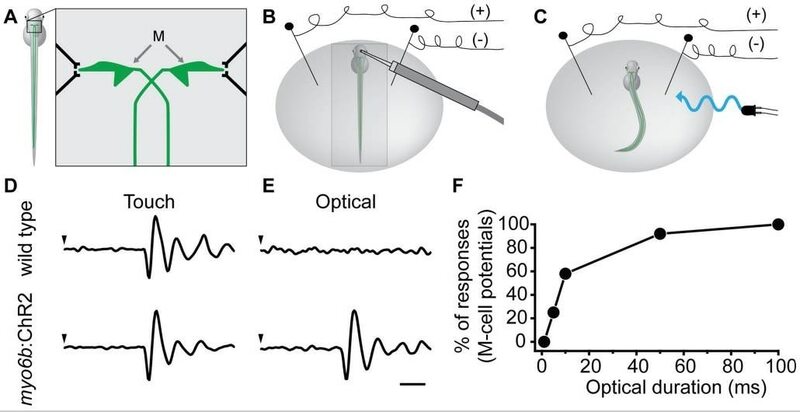 (B, C) Diagrams of the setup for field recordings of M-cell potentials from larval zebrafish. (B) A waterjet was used to stimulate touch receptors on the head of a larva embedded in low melt agarose. (C) For optical stimuli, field potentials were collected from free-swimming transgenic larvae. (D) In both wild type and myo6b:ChR2 transgenic larvae, the M-cell was activated in response to a 100-ms touch stimulus (onset at arrowhead). (E) In wild-type larvae, the M-cell was not activated by flashes of ∼470-nm light (n = 18). Transgenic myo6b:ChR2 larva responded to ∼470-nm light with both a field potential (n = 55; scale bar 2 ms for D and E) and an escape response (not shown). (F) Increasing the duration of optical flashes increased the percentage of observed field potentials (seen in E) and escape responses in transgenic larvae (n = 12). Note that flashes that were 100-ms or greater resulted in 100% success rate for observed escape responses and field potentials. There are currently no Customer reviews or Questions for ab120542.